Amid the usual chaos at one of India’s busiest railway terminals stood a group of people wearing a sombre look. KOLKATA: Amid the usual chaos at one of India’s busiest railway terminals stood a group of people wearing a sombre look. They were in no hurry unlike the rest. 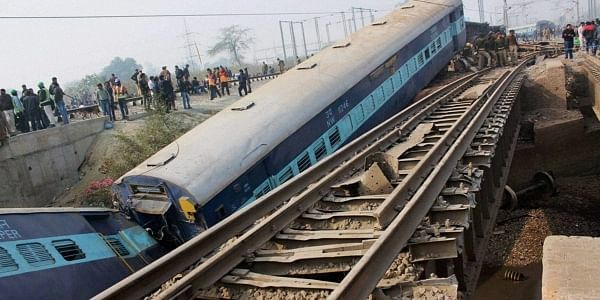 These tensed people were the family of the passengers travelling in the 12987 Sealdah-Ajmer Express that derailed over a bridge near Rura railway station in Kanpur Dehat district of Uttar Pradesh. Biting their nails, the kin were eagerly waiting near a help desk opened at the Sealdah station on Wednesday morning for news of their loved ones and when they could return home. Of the 63 injured in the rail disaster, 18 are from West Bengal, sources revealed. The accident has smashed dreams of many. “My uncle saved money for seven long years to make a journey to Ajmer Sharif. Mecca and Haj are out of bounds for poor folks like us. So, he wanted to visit the Sufi shrine. The motorbike mechanic was so happy to be able to go on the trip with his wife and three children. Now, they are in a hospital in Kanpur. I spoke with him and he assured that they are safe and will return back home,” said Sheikh Irfan of Park Circus in Kolkata. For others, the scope of a better future was on the anvil. “My daughter went for an exam in Jaipur. Now, I don’t want her to leave home for any ridiculous examination,” said Tapan Bhowmick, who spoke to his daughter Tapasi, a 21-year-old woman who is scared and nobody to comfort her. “My aged parents had taken the train to meet their distant relatives in Agra, with whom they got in touch after some 10 years. I could not connect with them in the morning so came to Sealdah. I was relieved not to find my parents’ name in the injured list. I could speak to them later. They are safe. I wanted to take a flight to Lucknow and reach them but they warned me against it and said they have already reached Lucknow to catch a flight back home,” said Ranajit Mukherjee, an IT employee in Sector V, Salt Lake. Officials have revealed that major casualties were averted as the train was moving very slow due to dense fog.